This is the time of year, after shearing, that I am usually scouring fleece every day. This consumes lots of water, not to mention electricity for heating the water to a near boiling temperature. As we are on well water, I have been conscious of conserving water during this hot, dry spell but I still need to clean lots of fleece. I have known about a method whereby a raw, dirty fleece can actually clean itself through fermentation, Fermented Suint Method (FSM), which is used extensively in New Zealand and is being used elsewhere. This method is basically for cleaning large quantities of fleece without the use of detergents. The suint, or sheep’s sweat, woolgrease, and water ferments and produces a natural soap. Once your initial fleece soaks for about 7 days, the following fleeces will take less time to clean…about 3 days. Usually collected rainwater is used, but with the current shortage of rain, I just used well water. The softer the water, the better. There is an excellent article with step by step instructions on cleaning wool by FSM on https://mozfiberlife.wordpress.com/fsm/. Have a look and give it a try. Just a warning. 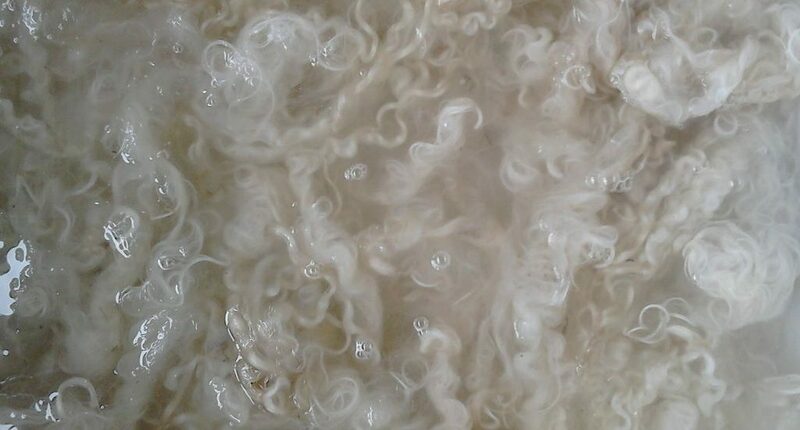 The fermented wool will have a stinky smell while wet, but once it dries, there is no odour. Natural Dyeing Summer WorkshopTake a truly wonderful weaving class!